CineFilipino 2015, organized and led by Unitel Productions, promises more moving stories and a more diverse mix of genres with an unexpected significant increase in entries, up to 20% versus the first festival in 2013. CineFilipino 2015 has expanded its film categories to feature a competition for feature-length movies, shorts section which now includes mobile, online content and short features, documentary and TV series in digital format. Mobile and Online sub-categories are the new additions to this year’s film festival. The Feature-Length category attracted 151 submissions. For the new categories, 51 Documentaries came in while 34 were listed under TV Series. Under the Shorts category were a total of 206 entries: 164 for Short Features, 15 for Mobile and 26 for the Online platform. A total of 442 filmamakers vie for the chance to break into the business through interactions with industry veterans at CineFilipino training and workshops. This is on top of the P 26M to be given away in terms of grants and prizes. “We are excited for this year’s turnout. We have made CineFilipino bigger by expanding the categories, increasing the grants, giving good prizes to our top winners and inviting reputable Filipino and foreign judges to select the finalists and winners. 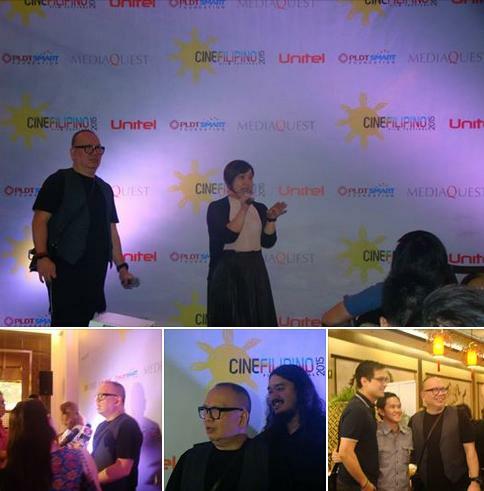 Film enthusiasts and the filmmakers can definitely expect more this year,” said Madonna Tarrayo, Festival Director and President of Unitel, during the announcement of top pick CineFilipino 2015 entries at the Maxims Hotel last August 24. CineFilipino 2015 Head of Film Festival Competition, Direk Joey Reyes, said that "we expanded categories because we want to be prepared ... There is more to life than a romantic comedy." Independent films produced on a shoestring budget are sometimes the best because of their sophistication. Independent cinema offer "comedy with sense and sensibilities", he adds. The film festival, now on its second run, aims to tap up-and-coming and established filmmakers to explore topics that delve into the Filipino identity and culture, and define human experiences through a Filipino perspective. The results are thought-provoking, quality films. Skillfully demonstrated by the 2013 best pictures, ‘Ang Huling Cha-cha ni Anita’ and ‘Ang Kuwento ni Mabuti’, films that talk about societal and cultural issues can be told in an audience-friendly and distinctly Filipino perspective. The festival seeks to produce films that make Filipinos know more about their identity as a nation and as people. “Films have the power to ignite one’s passion, heal one’s heart and open one’s eyes to the possibilities this world has to offer. This year’s finalists offer stories that aim to do at least one of these things which make for a soul-satisfying experience. Our theme, ‘Stories worth watching. Movies worth celebrating’, fully encompasses what CineFilipino is about and what filmgoers can expect from this new batch,” Tarrayo said. CineFilipino Film Festival 2015 helps independent films become more mainstream. Let us support indie filmmakers and their unique stories as CineFilipino 2015 takes centerstage in February 2016. CineFilipino 2015 is supported by TV5, Meralco, Mediaquest Philippine Global Network and Metro Pacific Tollways Corporation (MPTC). Do visit the official website, www.cinefilipino.com for further information.